This year sees me interviewing 10 amazing women in project management to celebrate blogging for 10 years. 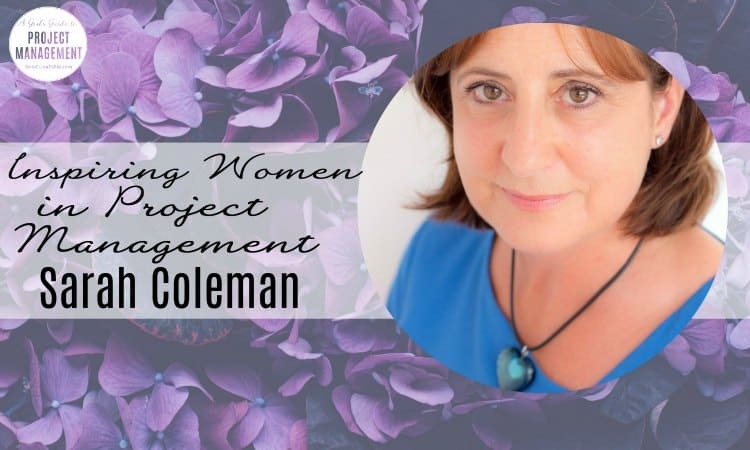 Today it’s the turn of Sarah Coleman, who has been inspirational in her work in leadership. 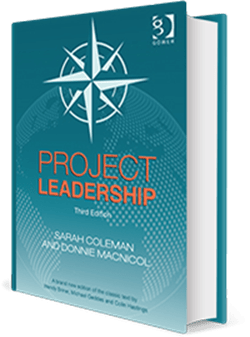 Sarah is coauthor of *, a book about…leading projects! Now in its third edition, it’s a practical book covering engagement, communication, vision and strategy. Sarah has a huge pedigree leading change projects. I caught up with her to find out how leadership has changed project management forever. Sarah, what transformation has taken place in project management with regards to leadership? The recognition that leadership is not just left to the senior tier of the organisation at board level so that that every project manager needs some leadership capabilities in order to be successful. Project management is increasingly being used as a management tool across all industry sectors for diverse types of non-business-as-usual activities. It supports organisations in the design, development and delivery of products and services for external clients; it supports organisations in their need for technically complex products and processes, ever-shortening design-to-market windows for new products, the need for cross-functional expertise and the implementation of outsourcing agreements. And at the same time, it is increasingly moving away from a preoccupation with project planning and control tools as the keys to success, and towards the management and leadership of people and their performance. We are in a much less predictable business environment and organisations have to be more agile. Moreover, with the economic downturn over the last several years, we are in a much less predictable business environment and organisations have to be more opportunistic and more agile. Especially with redundancies and the new realities of working (for example, influencing without authority, collaboration, matrix and virtual working) the organisation expects the same for less, or even more for less. As a result of all these, I believe that the relevance and value of leadership competencies and behaviours across all levels and functions of the business, including projects, is becoming more apparent. Regardless of whether you have the title of “leader” or “manager”, “planner” or “administrator” we all understand that leadership capabilities are useful to your role. Since my own background is in project and programme management, I find the shift towards leadership especially interesting and exciting. It’s a big shift – a welcome one, but a big one if you think about what project management meant 10 years ago. Why do you think we are more aware of the power of leadership today? To my mind, there is a growing awareness of the human factors behind projects; a sense that projects are essentially human endeavours and it is our communication, management and leadership of people that helps secure success. This is not to diminish the importance or role of planning, risk, value analysis and all other traditional “hard” skill sets; rather, it is a rebalancing of the skills required. And it is not just in the construction and heavy engineering industries. Projects worldwide range from software development and new product launches, to business change initiatives, and to major sporting and entertainment events. And the people involved are different too, wouldn’t you say? These projects can range from the small and discrete to the large, complex multi-currency projects involving tiered supply chain, multicultural and multi-located virtual teams in multiple time zones, and responsible to a wide range of stakeholders all focused on their particular idea of ‘success’. Projects are no longer typically deliverable from within a single organisation but need collaboration and partnership, often from organisations in different countries and cultures resulting in global project teams. Some of these are ‘long-haul’ projects: those that not only take years to conclude, but whose outcomes and deliverables extend beyond a lifetime. During this timeframe, the external environment often changes and can have significant implications for the project so that the ability to respond quickly and flexibly is crucial. All these trends lend themselves to leadership behaviours and competencies. Tell me more about Project Leadership. You and Donnie MacNichol worked together to update a previous version of this book. What was it like to work from a previous manuscript? Writing a further edition of a book which has already been previously published has both advantages and disadvantages. One advantage is that the “brand” is already out there and has been successful for the original three authors and for the publisher, Gower. Of course, this then puts particular pressure on any new authors taking up the challenge of producing a successful next edition. One of the particular issues was that the second edition was published over 16 years ago, and much has happened in that time with regard to global markets opening up, how the economy has fared, technology and social media as well as the huge amount of research and publications about leadership in general. We do hope we have found the balance of staying true to the concept and tone of the original two editions, whilst updating the content and introducing many new ideas of our own. One of the things we were most conscious of was ensuring that the original three authors were comfortable with what we were trying to achieve. I started by reading and re-reading the second edition to deconstruct it and understand the way it was written: how it was structured, the choice of content, and the tone of the book. In itself, this took a while to do. I then sat down to provide a new structure for the third edition. Once Donnie and I had discussed it, and had the opportunity to meet up with the original three authors, we ditched that and started again with a blank sheet of paper! I also had to document in some detail which parts of the book we would retain, which we talk about in more detail because of new thinking and research undertaken in the interim, and which we felt were no longer relevant. In reality, everything was relevant but with a proscribed word count it meant that we had to make some difficult decisions about what we explored in detail and what we needed to summarise. I know you’re still writing. What book projects do you have on the go now? My next book is about organisational change for Kogan Page. It looks at change of all types across different geographies, industry sectors and organisation types and focuses on how they can gain maximum value from their investment in change. Organisations are increasingly using intentional, structured change programmes to respond to competitors and the market, rather than leave it to chance. We all know that organisations today are operating against a background of constant and major change both globally and competitively, and to survive and thrive they need to change quickly and successfully. Driven by this, organisations are increasingly using intentional, structured change programmes to respond to competitors and the market as a way to refocus their operations and shift culture, rather than leave it to chance. Each year, organisations around the world collectively invest a huge amount of money, time and energy on change in order to improve organisational performance and to support growth. They want to grow their operations and revenues, their markets, their service and product portfolios, by acquisition or organic growth. At the same time, organisations often view change as “difficult”. The book is aimed very much at practitioners: from those formally trained and qualified change practitioners, to business leaders, and to those who have been given the title “change manager” but have little or no experience to carry out the role. This time I am editing the book, having invited a range of existing and former experienced and senior business leaders across industry sectors to contribute specific chapters focused on specific themes about organisational change. It will be very much practitioner-led, with many case studies and personal experience; it will be very much in contrast to the “how to” qualification-led books and current academic books on change. Filed Under: Working Women Tagged With: This article contains affiliate links.